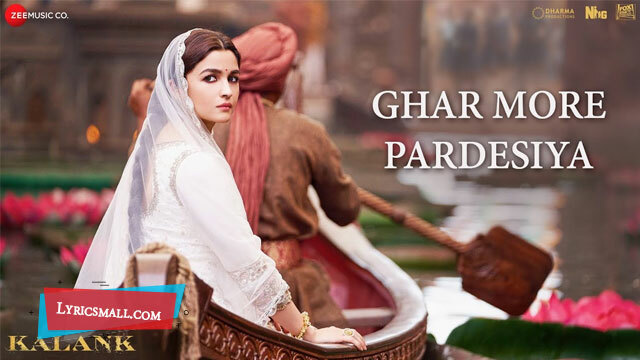 Ghar More Pardesiya song lyrics from Kalank Hindi Movie. Directed by Abhishek Varman. Produced by Karan Johar, Sajid Nadiadwala, Hiroo Yash Johar, Apoorva Mehta under the banner Fox Star Studios, Dharma Productions, Nadiadwala Grandson Entertainment. Starring Madhuri Dixit, Sonakshi Sinha, Alia Bhatt, Varun Dhawan, Aditya Roy Kapur, Sanjay Dutt in lead roles. Music composed by Pritam. Lyrics were written by Amitabh Bhattacharya. Sung by Shreya Ghoshal, Vaishali Mhade. Song released under Zee Music Company official label.